You can use almost any kind of chorizo as long as it is the fully cured variety and not raw or soft. Choose high-end Iberico chorizo for the most luxurious results, but the common horseshoe variety or even pre-sliced packaged type is still brimming with smoky, paprika-tinged flavour. Select a picante variety if you’re after something hot and spicy. Slice the chorizo as finely as possible for the crispiest outcome – asking your local deli or butcher to slice it using a meat-slicer will yield the best results, but you can use a sharp knife at home and still get some incredible chorizo crisps. Chorizo crisps make a great snack on their own, but try mixing them with homemade potato or vegetable crisps. Sprinkle with a little sea salt or fresh or dried herbs for an extra layer of flavour. They're also very useful when preparing canapés, as they add both texture and taste to other ingredients. Try using the crisps as an alternative to mini crackers or pastry bases to create amazing little bites – top them with other ingredients and decorate with micro herbs. As the fatty chorizo releases lots of delicious flavoured oils as it cooks, try stirring the residue oil through softened butter and fold through crumbled pieces of chorizo crips to create a richly flavoured compound butter. 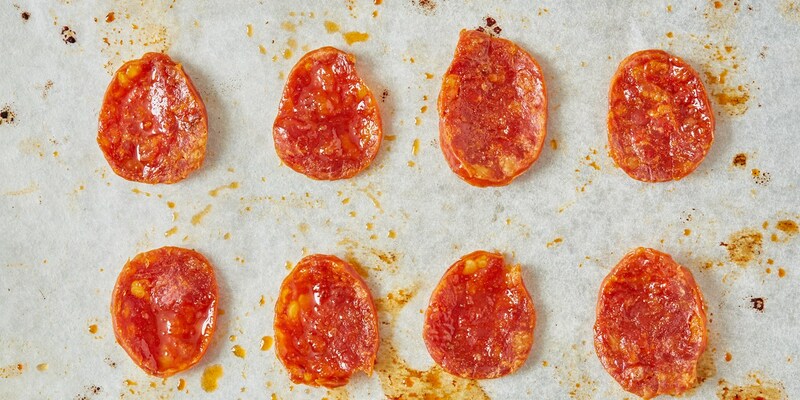 For inspiration on how to use chorizo crisps in recipes, look to the UK's best chefs. Agnar Sverrisson garnishes his elegant Icelandic cod, avocado and chorizo dish with a fine crisp to add texture to the plate, while Angel Zapata Martin also fries his chorizo until crisp in his delicious breakfast of Huevos rotos con chorizo.